Recently, I attended a baby shower for my daughter-in-law. It was a fun event with good food, lots of love and laughter, and plenty of presents to stock the nursery. As I helped her load her car, I thought of all the time and preparation that went into the shower, but also the preparation involved in moving to the next chapter in my son’s and daughter-in-law’s life together, the addition of a child. Even with all the organizing, planning, and preparation they are going to encounter unexpected bumps and hurdles as the move to this next phase of life. It’s the same any time you transition from now to next. Familiar patterns change. Unforeseen circumstances crop up. Uncomfortable feelings surface. But you can’t move ahead if you’re unwilling to leave where you are, and despite uncertainties, the next steps may lead to more joy and fulfillment than you’d ever experience if you refused to go. So what’s involved in preparation? Getting the picture – In order to prepare, you have to know the goal, destination, or outcome you anticipate. Some people have a hard time visualizing. If you’re one of those people, go at this from the opposite direction. Look at your current circumstances and decide what you could remove to change the picture to a better image. Start by answering this question: What would my life look life if I deleted _______? It could be an emotion, a habit, an unhealthy relationship, or anything else that has you bound to your current situation. Then, think of how the landscape of your life would look minus that thing. Now, you’re getting the picture! Gathering supplies – For some, gathering supplies is part of their creative process. Our daughter enjoyed making jewelry for a while, and her creativity was sparked by gathering beads, sorting them into compartments, and then positioning them on a board. The design changed multiple times before she could say, “This is right!” Others are the same with planning an event or decorating a space. They gather more supplies than necessary so they can have options visually available as they create the environment. You may need to gather more than you actually need to change your perspective, attitude, or circumstances and you may have to change or rearrange various components before you reach the right combination. Organizing – Have you discovered that life is a lot less frustrating when you’re organized? If you take time to designate a location for items and then return them to that location after use, you avoid frantic searches for things when you’re on a tight schedule. And taking a few minutes to make a list or find things you’re not sure about shaves time off precious minutes the next day. But often procrastination wins and frustration ensues. For some, organizing is a control thing. Although others are available and willing to help, you’re resistant because it feels like losing a level of control. But listening to other possibilities broadens narrow vision and makes us look beyond pre-conceived ideas. Taking the next step – In cleaning out several rooms for a house renovation, I discovered craft supplies or home improvement project materials still untouched in the original packaging in various locations around the house. We had good intentions and enthusiasm for the projects when we bought the supplies, but, for whatever reason, lacked motivation to actually do the work. You may have done the same in some area of your life where you need to move forward. Perhaps you bought books, researched courses, or made lists, but never read the books, took the classes, or acted on what you listed. While it made you feel like you were doing something to move ahead, you lost momentum and never completed the work. Sometimes we puts lots of effort into preparing, but never follow through. Having a vision and gathering and organizing materials doesn’t do much good if you never implement the plan. 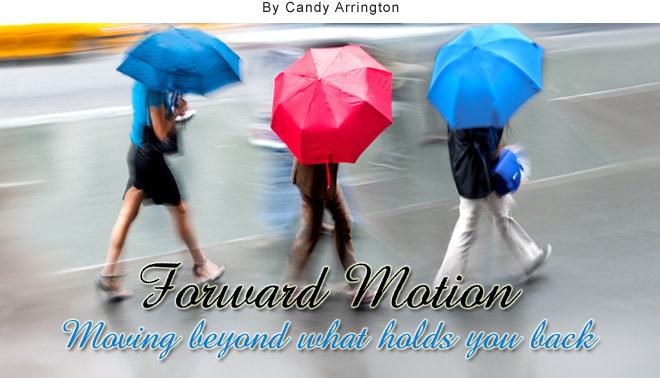 While preparation is an important part of moving forward, locomotion is still required. Prepare and then step out in faith.